I know what you must be thinking? Two interior design posts back-to-back? So, unlike me, but i know you secretly love it and get inspired. After you really analyze that rug you will immediately forgive me. It's good right? 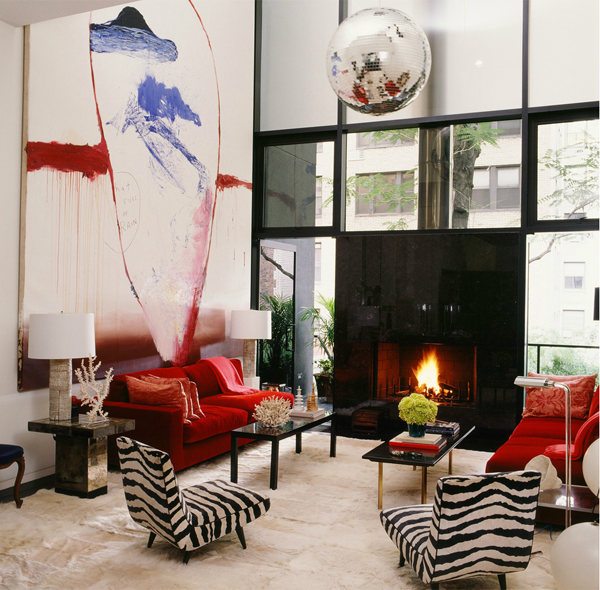 This NYC townhouse (and the rug) was designed by architect William Georgis. The rug immediately captivated my heart. You remember my splatter post from way back? Well, I'm still not over it and this rug just made my yearning for splatter deeper. The second thing that captivated me was the curved sofa. You all know how much I love them from this post here. 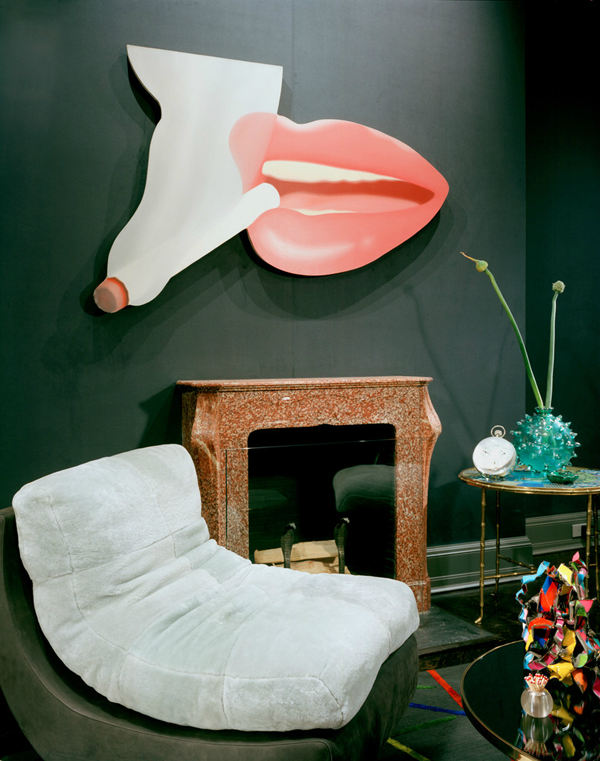 The art, the massive space, the scale of the pieces, just add so much drama making these rooms glamorous and maybe even rebellious. I also included some photos of some of his other projects. A disco ball and everything...hmmm. In reality this is all a bit much for me but I find the style exciting and it sparks many ideas. And idea generation is what it's all about, right? Check out the rest of Georgis portfolio here. He even has a book out, which you can buy here. Happy Hump day my sweets. Definitely something for everyone. Yes, I could look at interiors all day long. It never gets old. So bold! 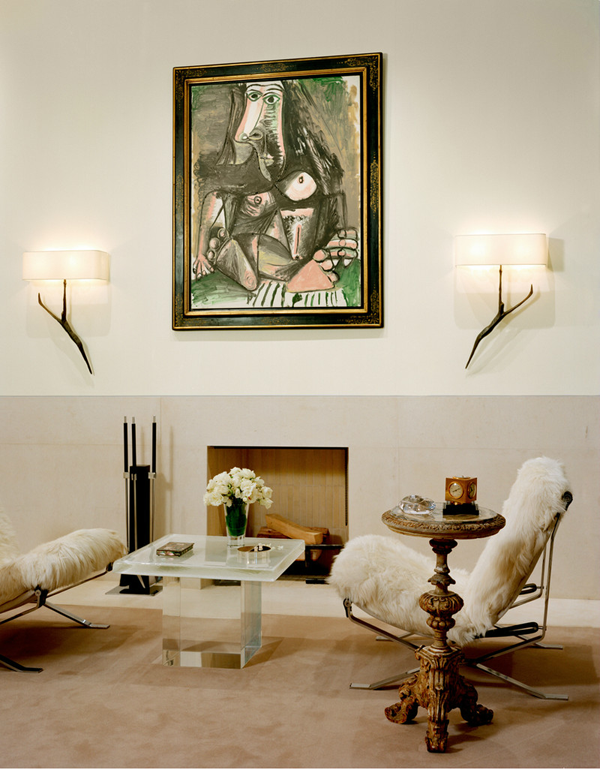 Love the gallery wall and I thought the sconces were branch sconces at first, then I realized they were human figures! I just pinned half of those images! Such gorgeous interior spaces! So much to look at. A little too crazy for my taste BUT I love that there is a random kids swing in the living room? Not sure why that is what I noticed first lol. It is very busy... But I love the major color contrasts in the rooms. You are KILLING me with these! 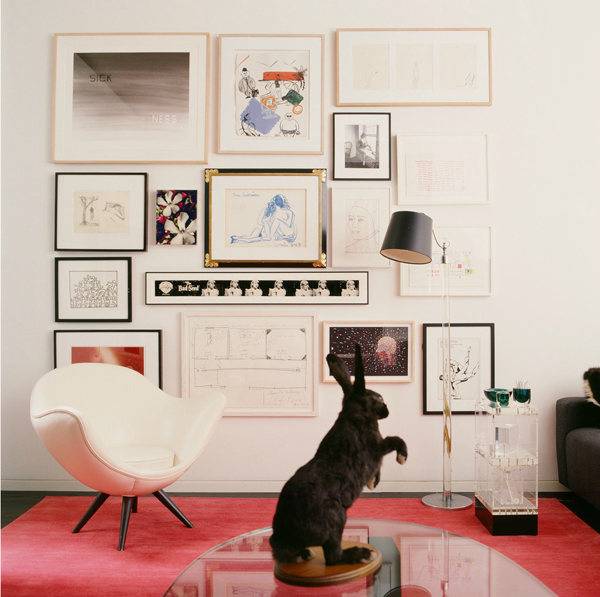 So gorgeous, I am particularly swooning over that rug in the first two photographs, just stunning! Obviously the rug... but I was NOT expecting a full abstract red wall mural in that first room behind the couch. Wow! Bright v. dark, playful v. morbid. Lots of tension. But overall, it's really inventive. Are these rooms to sit back and watch TV in? Probably not. But I can see each as it's own individual work of art and there is definitely at least one element in each that I really love. Great post. 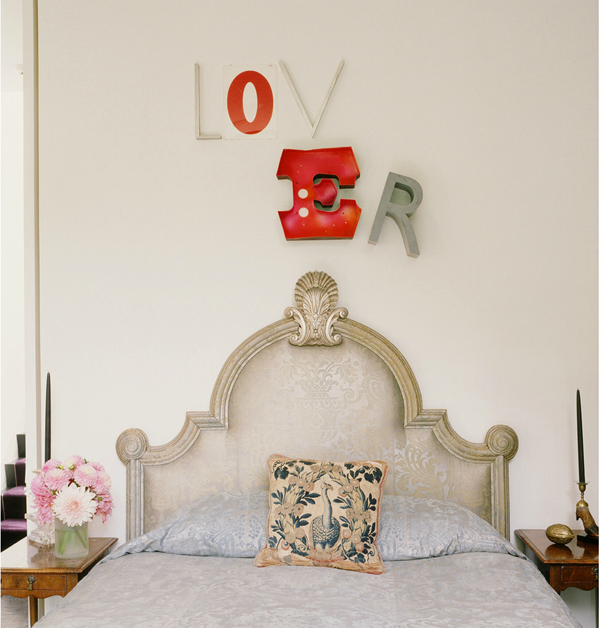 Love love love this style, could happily live in any of these rooms!! Wow! Lots to look at here! You know I am loving all the B/W and the carpet and the red painting on the first few photos! Wowza! Love all of it and wish more people could be bold like this in their design! Its so refreshing!! That rug is absolutely stunning! You have such a great eye for things! 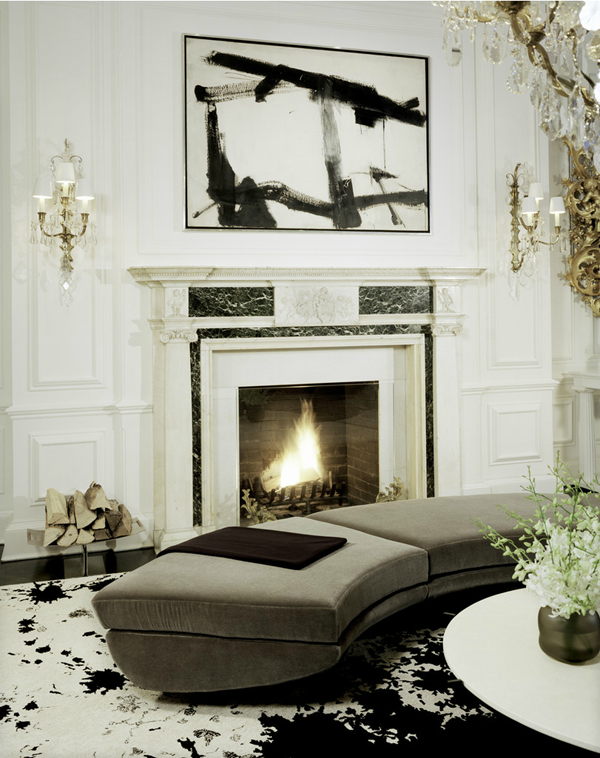 What an amazing place...I love all of the pops of B&W and yes that spotted rug is TO DIE FOR!! Stunning! Rebellious...as you mentioned in the post. Every room has mystery and drama. Love it!